We are having a Children's Party to celebrate our opening! Everyone is welcome to attend this FREE community event held at our Child Care Centre in the Ultimo Community Centre. There will be a BBQ, Playdough, Art, Enrolment Special Offers, Tours Available and Prizes to give away! To be in a draw to win prizes or just to let us know you'll be attending please fill out the form. Our professional and experienced partners working with us to deliver an exiting, educational, cognitive and physical developmental program will be at the party as well. Gymbaroo, Growfit, Ukebebe and ChiFUNese will be demonstrating and/or instructing classes for small groups of children. Please note the scheduled times below for these classes as there are limited numbers. You will also get a chance to sample our creative, nutritious, amazingly tasty children's menu prepared daily by our chefs at Kids Gourmet Foods. Growfit: 12:30pm - 1:30pm Class is suitable for 2 years old or older. Limited numbers. ChiFUNese: Available throughout event, classes unspecified. REGISTER TO WIN PRIZES AT THE PARTY! Thank you for entering your details for a chance to win prizes at our party. Your details will not be shared with marketers or anyone else for that matter. We look forward to seeing you at the party! And good luck! Free enrolment + 1st week free! 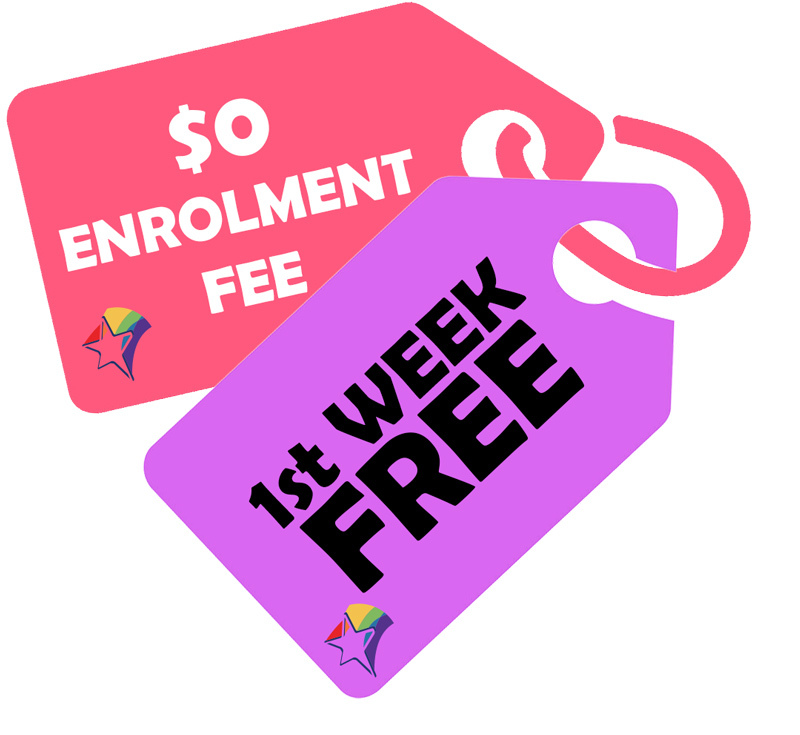 We are pleased to extend our free enrolment offer to include your first week of care for free. Whether you have just moved into the area or you are not happy with your current service, looking for another centre can be time consuming and stressful. We understand every parent wants the best for their child and yet so many settle for a centre they are not entirely happy with, be it staff retention issues, lack of resources or the management's philosophy. 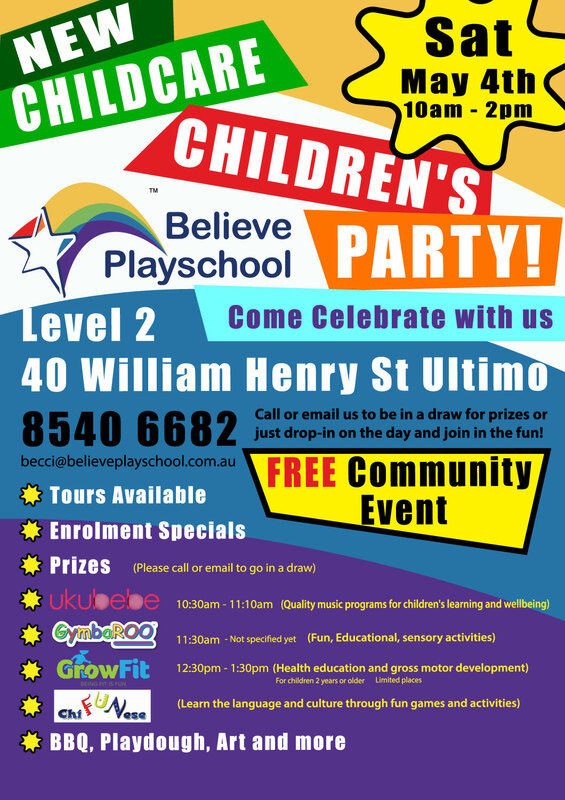 Believe Playschool is a family owned and operated child care centre. Our focus and ideas are simple but have an enormous impact. We encourage families to take as many tours as possible in their prospective areas. When you find the right centre it will reflect in your child and that is more than worth the effort. If Believe Playschool is in your catchment we would be delighted to be among your consideration. We have had overwhelmingly positive responses from families that have toured our centre. We are new and only opened our service on the 25th March 2019. So far 9 out of 10 families that visit end up enrolling, some immediately, some soon and others next year. Feel free to drop-in at your convenience between 7am - 6pm Monday to Friday or on weekends by appointment. Don't forget you are invited to our 'Children's Party' on the 4th May 10am - 2pm. New family owned and operated child care centre in Ultimo. 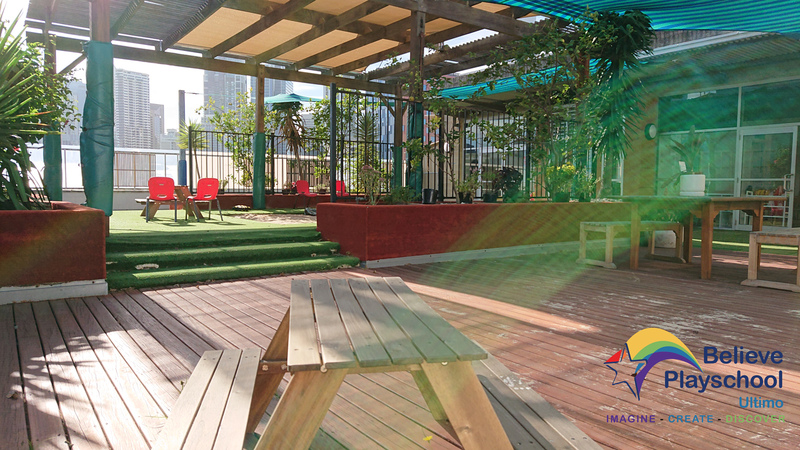 is a new child care in Ultimo, located on level 2 of the Community Centre (Ultimo). 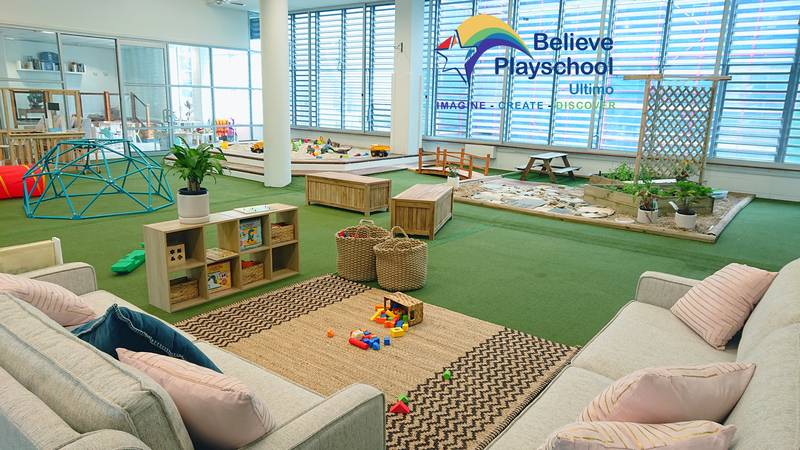 Believe Playschool is the creation of Becci, who has over 13 years of teaching and child care management experience of both large corporations and boutique centres. She felt there was a need for more consistent higher quality experiences in child care. Becci has been poached and offered various opportunities but decided to open her own centre and upholding her practices and values, ensuring all her staff are genuinely invested, autonomous and enjoy caring for and educating children. The Ultimo Community Centre. Corner of Harris St and William Henry St.
We have dedicated drop-off and pick-up parking in the basement of the building, entry via Harris St. There is lift access from the car park that will take you directly up to the centre. Birth - 2 years $135. Toddlers 2 - 3 years $130. Preschoolers 3 - 6 years $125. We have plenty of outdoor play space. Being able to run around in an open space with fresh air and sunshine a necessity. We also have a huge indoor play space, when weather is not conducive to outdoor play. There is a "community space" where children from all classrooms and age groups are encouraged to interact, nurturing a collectivist quality and forming special relationships where the older children learn to mentor and become teachers and the younger children benefit from accelerated development through admiring what the older children can do. We occupy the same building as the Ultimo Community Centre and Library, accessing basketball, netball and tennis courts and sports equipment, as well as enjoying story time in English, Mandarin and other languages in the library. Call us on (02) 8540 6682 to arrange a tour or fill out the form below. We are a brand new centre (since 25 March 2019) so your feedback is highly valued. Below are current reviews from our Google presence., feel free to contribute. Excellent teaching and very hands on on taking care of the kids. Exceptional Caring Staff & Great Location. Looking forward to enrolling 2019. There is plenty of outdoor play-space at Believe Playschool. Being able to run around in an open space with fresh air and sunshine a necessity. We also have a huge indoor playground when weather is not conducive to outdoor play. Families are welcome to visit our centre and take a tour to see our facilities, abundance space and resources and get a feel for the culture, staff dynamics. Our classrooms are designed to accommodate each child's individual developmental needs, facilitating growth and education over maximising enrollment capacity. This ensures that more advanced children are not held back and those that are not ready are not forced to move on. Visit our CURRICULUM page for more information. At Believe Playschool we teach children life skills as well as school readiness. An academic head start is advantageous and having basic life skills will help little people develop independence and efficacy. We also facilitate self awareness and mindfulness of others. 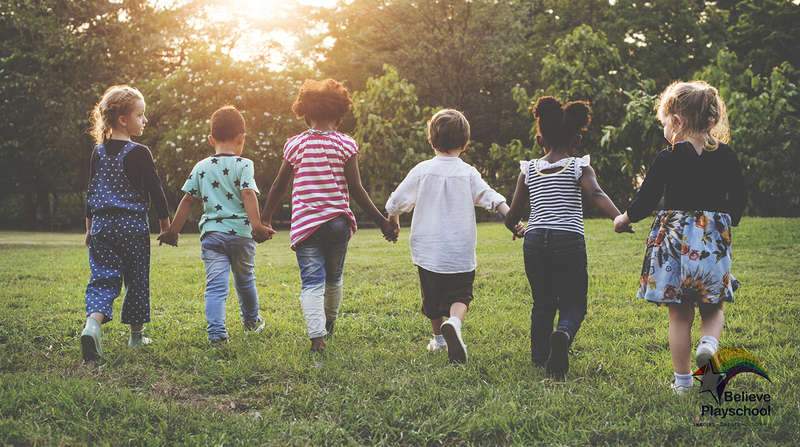 Learning to be respectful, considerate human beings through play, interaction and socialisation with other children and under the guidance of our educators. We are proactive in ensuring that every child feels safe and comfortable to learn and grow without fear and anxiety. We have zero tolerance for bullying & violence. Families are required to work with educators to change unacceptable violent or disruptive behaviours. BELIEVE PLAYSCHOOL selectively takes elements of practice from theories and approaches from around the world. We don’t believe that any one approach is 100% good or bad, rather we adopt what is most effective, appropriate, practical, inspiring and realistic. What works is passionate, endearing and engaging educators providing a hands-on play based program in a homely natural environment with small groups of children. We focus on communication, autonomy, self-help, resilience, citizenship, problem solving, and creativity enabling and empowering children with a solid foundation of life skills that they can apply and transfer to any situation they encounter, and ensuring smooth transitions into school and community life.